A new Obama administration get-tough policy on home-mortgage discrimination is drawing kudos from consumer advocates, along with expressions of serious concern from lawyers who represent lenders and brokers. 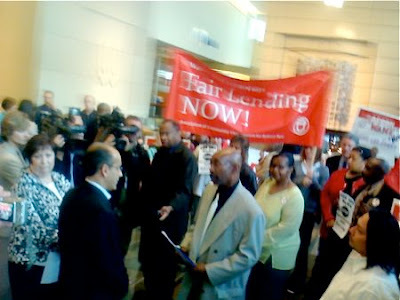 In a settlement last month with two subsidiaries of ailing insurance giant American International Group Inc., the Justice Department took aim at one of the most controversial practices of the housing boom years: National subprime mortgage lenders originated billions of dollars in high interest rate loans through local brokers who sometimes hit African-American and other minority applicants with excessive loan charges. Mortgages extended to African-Americans often carried higher fees than paid by white subprime applicants — even when the borrowers’ credit profiles and other factors were roughly the same. But did these disparities in fees open those lenders who purchased the loans from local brokers to legal attack? Weren’t the higher fees solely the result of predatory pricing by individual brokers operating independently of their wholesale lenders? If a broker charged African-Americans higher fees than whites, wasn’t this violation of fair lending laws on the broker’s shoulders? The Obama administration gave a resounding answer to that question: No! The consent order requires AIG’s subsidiaries to pay $6.1 million to roughly 2,500 African-American borrowers, or an average of $2,300 in cash restitution for overcharges per loan. The companies are also required to spend at least $1 million on consumer financial education programs. None of the firms admitted wrongdoing as part of the settlement. AIG Federal Savings Bank and Wilmington Finance Inc. no longer are involved in the wholesale mortgage market. AIG took a $182 billion bailout from the federal government in 2008, and is in the process of reorganizing its business activities. No individual mortgage brokers were cited in the case. The core message here, according to Justice Department officials: Lenders who use independent brokers to originate mortgages cannot ignore what those brokers are doing to their minority customers. They will be held responsible for civil rights violations because they should have been monitoring their broker networks for signs of discriminatory pricing — which should be detectable by examining loan packages and performing statistical analyses. Perez warned that many other lenders who use broker networks could also be vulnerable to legal actions. Community groups and civil rights advocates hailed the settlement as a huge step forward. “It’s a new day for borrowers,” said David Berenbaum, chief program officer for the National Community Reinvestment Coalition. “Borrowers should see fewer backdoor pricing abuses” — especially the bloated fees, interest rates and unequal underwriting standards that were commonplace during the housing boom years. But some mortgage industry groups and lawyers who specialize in financial issues disagree. They argue that holding giant wholesale lenders responsible for illegal acts they did not themselves directly commit not only is unfair but will do long-term harm to all borrowers. Roy DeLoach, CEO of the National Association of Mortgage Brokers, said “we absolutely oppose discrimination in any form. But we think the government’s target should be the persons who actually do the discriminating” — in this case, individual, local brokers — not the lenders who acquired the loans with no knowledge of the discriminatory fees. DeLoach argues that the administration’s approach will discourage some lenders from dealing with brokers in general, thereby reducing competition in the marketplace, especially areas with significant minority populations. “There will be less choice for borrowers” with fewer brokers active in the market competing for business. “That inevitably means higher rates and worse terms” because just a handful of big banks will dominate the mortgage business, DeLoach said. Paul F. Hancock, a partner with the law firm K&L Gates who served for 20 years in the Justice Department’s Civil Rights Division and was a deputy attorney general in Florida, says the AIG settlement “is really stretching the law, maybe even going beyond the law” by holding lenders responsible for the actions of independent brokers. Bottom line for consumers: Look for more fair lending settlements, more financial restitutions, and much closer supervision of loan officers -- whether they’re on lenders’ staffs or independent brokers -- to ensure that every mortgage applicant gets equal treatment. Ken Harney’s e-mail address is kenharney(at)earthlink.net. Fighting for ALL The People !